Some of us will succumb to colds and flu more than others and end up resorting to even using paracetamol and ibrufen for children; despite latest research warning health risk to children and in adults increasing the risk of stroke. Echinacea tablets not only encourage a healthier natural immune response but as a long term preventative help to reduce your salt intake: Did you know that each pain killer tablet has a high content of salt to make it easily dissolve in water. We already know that too much salt is linked to higher risk of heart attack in stroke, and ibrufen and other well known over the counter pain killers taken by millions in Britain could be causing earlier death, when prevention using alternative herbal remedies should be the healthiest option along with healthy diet. What is Echinacea? 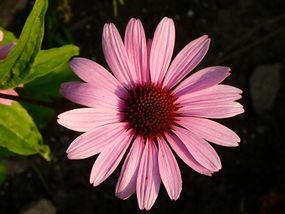 Echinacea is a flower derived from the daisy family that have a elevated cone like centre made up of soft spines frequently used in herbal medicine, as a natural antibiotic to heal wounds. Echinacea for colds: you will be pleased to know that there are no known Echinacea side effects, taking Echinacea tablets can also be considered alongside vitamin C as being one of natures best antibiotics and Echinacea tablets can be taken all year round to give you and your family that extra protection against hayfever, colds, flu, for a healthier strong immune system. Echinacea dosage: Ideally suitable for vegetarians and vegans in our 1000mg tablets. One tablet can be taken daily with some water. Storage must be ideally in the cool away from children and this food supplement should not be used as a substitute for a healthy diet. Echinacea is effective in both bacterial and viral attacks: benefits of echinacea is It may be used in conditions such as boils, septicaemia and many other infections in conjunction with other herbs it may be used for infections anywhere in the body. It is especially useful for infections of the upper respiratory tract such as laryngitis, tonsillitis, and for the catarrhal conditions of the nose and the sinus, In general it may be used widely and safely. Also find below our Vitamin C Calcium Ascorbic formula under: 'products we also recomend list'. There are researchers now urging people not to take soluble pain killers on a regular basis- please be kind and gentle to your body and peruse body and mind shop website for healthier alternatives. We are hear to help e-mail us if you need any assistance.